Been there, done that. : Have You Been Blindsided? 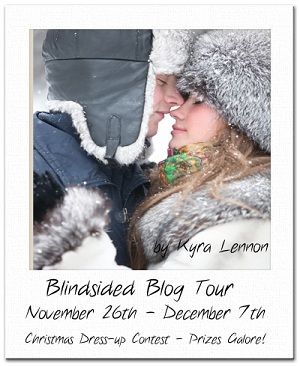 Kyra Lennon is having a Christmas Photo Bloghop to help promote her new book "Blindsided", she wants to see our Christmas dress-up photos! She says, " Whether you're dressed up as Rudolph, or simply wearing a tinsel scarf, I want to see YOU wearing something festive! The photo has to be either brand new, or from sometime over the last few years - childhood photos will not count! You can put in as much or as little effort as you wish - the only requirement is you have a bit of fun with it." 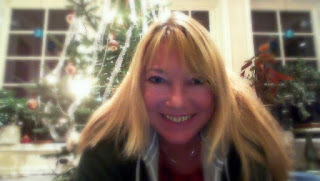 Here is a Picture of me in front of the Christmas tree last year. I am usually the one taking pictures so there are not so many of me, I had to work hard to find this one. You can't see much of it, but yes I am wearing a dress. Now have some fun and go check out what our other friends are wearing at Chrismas. If you have not seen Minnies Gibberish Shopping fun, it is not to late to add to her shopping trip. Check out the story HERE. It will be posted finished on Dec. 1st. Roland and I have also contributed short stories in the anthology "Fractured Fairy Tales," which is being released on December 1st. More details about this and a fantastic Bookfair on my blog tomorrow so don't forget to come back. December is going to be a great month with so much happening and so much love to share! I hope you will spend some of that time with me as I share my Christmas Calander each day with all of you. Have any of you noticed an increased problem with the spam of Anonymous posts in your blog? I hate word verification and have tried comment modification but am not to fond of that either. Any suggestions? Plugging Roland's contest tomorrow and when I have the details on that book, I'll mention it Monday for you. I don't allow anonymous comments and comments on posts older than four days require approval. As a result, I get almost no spam. Love your quick pic in front of your tree! And yes, there's been a huge increase in spam- I don't do word verification (hate it) but luckily the blogger spam filter catches most of it instead of posting it. I've noticed with alarm your comments being beseiged by spam lately. It made me mad on your behalf. I believe Alex's suggestion would help immensely with your problem. Thanks again for talking about my contest/ I look forward to sharing print with you in the OPEN DOORS anthology! To get rid of my anonymous spam, I just made it so anonymous people couldn't comment anymore, and, I turned on monitoring of comments for anything older than a day. That helped immensely. I've begun having a problem with anon comments and am thinking about doing what Alex has done. Problem is, I have friends who don't have blogs and want to leave comments, so will wait until after the holidays. I don'tt allow anonymous comments which might be why I don't have any spam problems. I figure if a person wants to comment they should not hide behind the "anonymous" shield and just own their words. I have activated Comment Moderation as I do not blog daily and this prevents comments that are of a self-promoting nature to get air time on my site. I'm a tough cookie that way...my blog, my rules. That being said I think freedom to express oneself is vital...just not using "anonymous". I'm not a fan of WV and as a rule won't comment when it is present...my eyes just don't like straining so hard to figure it all out. Also, I can see where WV or CM would be a hinderance to your Gibberish game (which I played for the first time on you last post and loved) as this prevents the spontaneity and flow of writing. Anyhow...whatever you decide I'm confident you will choose the option that best works for you. Okay, I meant comment "anonymously". Not comment period. My mistake. I need to learn to proofread. Fabulous photo! I've been getting a lot more spam lately too. Blogger usually deletes it for me, but I get a little email about it before it does. Lovely photo! Thanks for being part of the Blindsided bloghop!